A grandmother speaks with RIP FM radio about what she learned during a video dissemination about complementary feeding, and why she encouraged her son to join her at the screening. Due to the relatively short, two-year duration of the program, SPRING’s work in Senegal relies on key partnerships with local producer organizations and media outlets to extend the reach of nutrition messages. Community radio programs, which are widely patronized in the three regions where SPRING intervenes, are a key element of SPRING/Senegal’s social and behavior change communication (SBCC) approach. This SBCC approach uses radio, video, and community mobilization events to disseminate information on themes related to nutrition, nutrition-sensitive agriculture, hygiene, and gender. SPRING/Senegal partners with six local radio stations to regularly produce and air 60-second spots on high-impact nutrition and hygiene practices. The radio stations include Niombato FM, Ndef Leng FM, Kaffrine FM, RIP FM, Alfayda FM, and Koungheul FM, which broadcast from Nioro, Foundiougne, Koungheul, Kaffrine, Fatick, and Kaolack, with a reach that covers SPRING’s entire intervention area. A reporter from Alfayda FM radio records Momath Diop and his wife give a testimonial about how he helps his wife fetch water, clean, and care for their children during a January 2017 gender training in Kaolack Region. In addition to broadcasting radio spots, the stations also feature programs produced with the technical support of SPRING staff. The programs use a talk show format to place community voices at their center, providing nutrition-related messages through live interviews with influential community members, local government unit (LGU) health workers, and representatives from agricultural partner networks. SPRING guides the content of these interviews by preparing questions for the DJs to ask and identifying community guests to participate. Each month the programs focus on a new topic that corresponds with the local food seasonal calendar, but also reminds listeners of previously discussed topics. Each month’s theme complements the community videos SPRING partners are disseminating during that month’s women’s group meetings, community meetings, and household visits. Themes covered include critical moments for hand washing, micronutrient-rich foods, the role of men in reducing women’s workload in the household, and vegetable gardening to improve nutrition and incomes in the household. Throughout the programs, listeners are encouraged to call in to ask the community influencers questions on the discussed topics and how to practically apply the lessons. SPRING also invites the DJs to attend SPRING workshops, video disseminations, or community mobilization events to conduct interviews with participants, which they broadcast at a later time. By coordinating these strategies, SPRING reinforces nutrition messages several times over, with community members hearing consistent information from trusted voices on nutrition-related best practices. This In Practice article was originally posted at SPRING here. 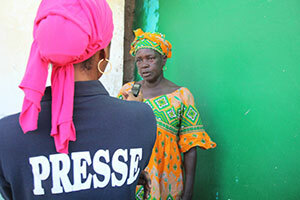 Download: Summary of the SPRING Project in Senegal.